Broadband provision has become almost as essential a service as electricity and water, so it is hard to imagine that for the first fifteen years of the present century, Whaddon languished in the slow lane of internet accessibility. Our own high-speed fibre connection went live at the end of October 2015, and since that time, nearly 75% of the houses in the core part of the village have connected to it (the houses in Cardiff place in Whaddon are connected to the Bassingbourn exchange; the core is part of Arrington exchange). For years various villagers, together with the Parish Council and our District and County Councillors, agitated for better connections. This finally happened thanks to the Connecting Cambridgeshire project, set up with assistance from central and local government to bring broadband to the more rural areas of the county. This page is now more historical than anything else, but it is important to realise that the connections we now take for granted have not been there all that long, and we should all pay tribute to the village as a whole for supporting the aim and for putting its money where its mouth is when the connection went live. We have the highest rate of connections in the county, and one of the highest in the country. Read on to learn a little about another of Whaddon's achievements. After a hiccup entirely down to the very high take-up rate of broadband in the village, Whaddon's cabinet 3 is now able to have new lines connected to it again. The cabinet has received as many boards as it will take, which we hope will be enough for the village! 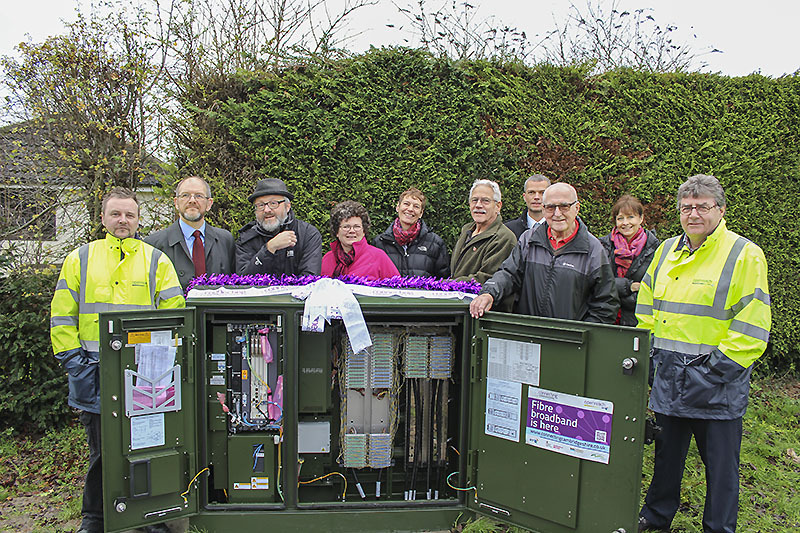 Villagers, Connecting Cambridgeshire, BT and Openreach all met at the cabinet to celebrate the arrival of broadband and particularly the fact that we have achieved the fastest take-up in the county! Below are a group photo and also an image of the inside the cabinet. A press release from Connecting Cambridgeshire is available here. OK, I was too optimistic, but take-up has been very brisk and so this is important about capacity. The following article was also placed in the Whaddon News. I won't be sending out any more regular updates, but I will from time to time ask how speeds are settling down over the next few months. Thank you all for being so enthusiastic and patient! 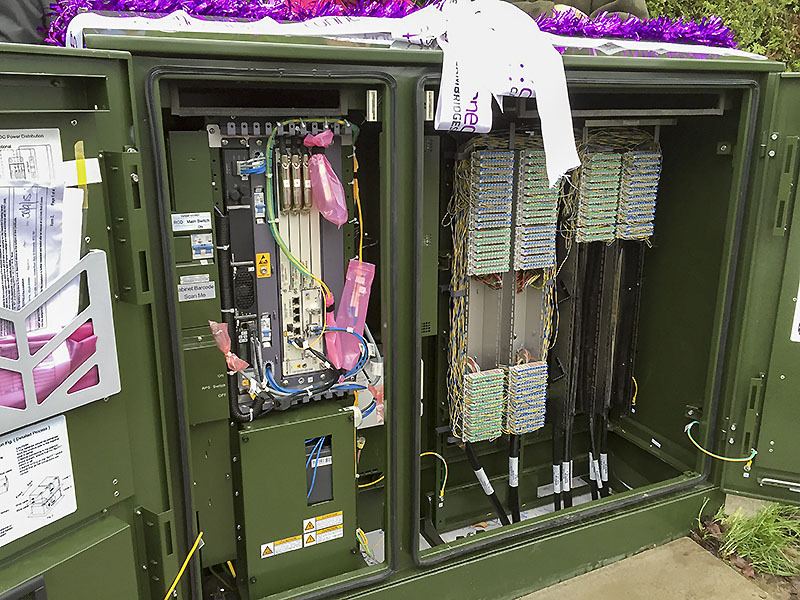 It would seem that all those who ordered in the first couple of weeks have now got their fibre connections, and the results are looking pretty good, even for those furthest from the cabinet. It's clear that changing suppliers takes longer than changing your package with the same supplier, but it all seems to work efficiently. There'll be a final update in the next Whaddon News. People seem to be able to order with no problems, with activation dates ranging from later this week for those who are staying with their current ISP, and next week for those changing ISPs. The technical issues which were preventing sign-up at Dyer's Green have been resolved. I am pleased to announce that the new cabinet for our broadband connection has gone live as of today. There are still a few errors to be shaken out of the data, but almost all residents can now order broadband from their chosen suppliers. I have sent out an update in more detail via the village email system. The file in question can be found by following this link.